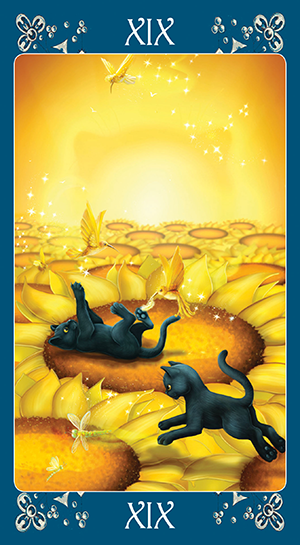 Today’s card — the Sun — comes from the Black Cats Tarot deck illustrated by Maria Kuara and distributed by Llewellyn. The sheer playfulness depicted in this card is enough to make anyone smile. You may have woken up today glad to put the old year behind you and looking forward to the new one. There’s a “New Lease on Life” aspect to this card, a sense of vitality, promise and anticipation for the future. if you’re reflecting on the past — and especially on changes you expected to see over the last 12 months that never quite came to fruition, now is the time to do something about it. This rendition conjures up similar images, albeit of the feline variety. Here we see two black cats romping gleefully atop a field of vibrant sunflowers. The Sun rises in the distance, illuminating the tiny dragonflies and hummingbirds that share their sacred space. All are joyfully “in the moment” — impervious to any danger or outside diversions. This is the essence of the Sun card. It speaks of optimism, enthusiasm, courage and hope. There’s a renewed sense of faith in the future, a carefree and spirited radiance, and a glimpse into our own potential — reminding us of all that we could be. If you haven’t yet made a New Years resolution right now is the time to do so. 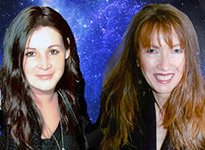 Think Big, plan big and then offer it up to the Universe. The Sky is the Limit! Today’s tarotscope — The Sun — comes from the beautiful Black Cats Tarot by Maria Kuara.